If you suffer from chronic neck pain, you probably realize that taking pain medication for the rest of your life is not a legitimate solution. All that does is cover the pain. The existing problem continues, and you may even add a new problem if you get hooked on the pain pills. We’re going to help you find a safe way to break free from chronic pain. Here are several natural ways to reduce stress on the neck. The last point may introduce you to an alternative therapy you never knew existed. One of the most common issues regarding neck pain is poor posture. A forward head position is common in the modern world of technology and office work. We’ll discuss that a little further later on in our article. For now, just realize that the atlas (top bone in the neck) balances the head, which weighs an average of about 12 pounds. A 60-degree forward head position increases that weight to 60 pounds of pressure on the neck, so you can see how quickly poor posture can become an issue and increase wear and tear on the spine. When you carry a heavy bag over one shoulder, it pulls your neck to one side. 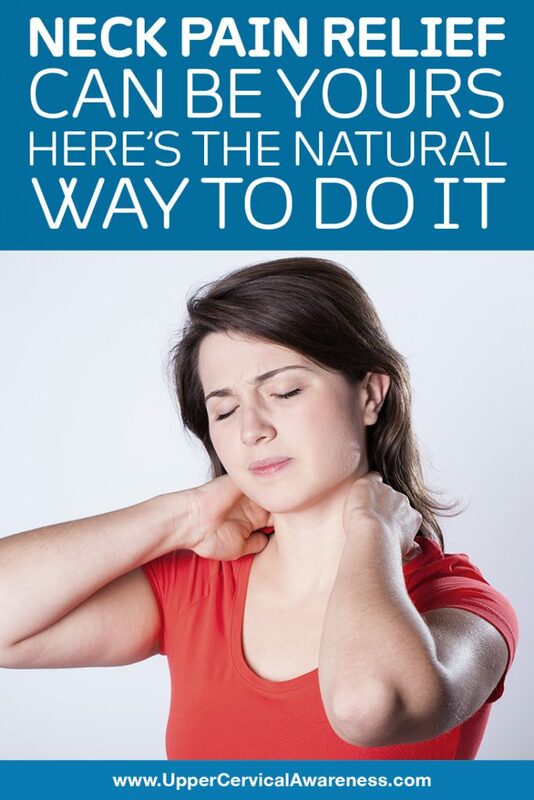 This can lead to a stiff or sore neck. It also affects your posture. While switching up sides may help a little, it’s better to minimize the weight in any bag that has to be carried on one shoulder. Also, if the strap is adjustable, try to carry the bag as high as possible. Crossbody bags or backpacks are better because they distribute the weight evenly. There are a few different elements of sleep that can affect your neck. First of all, you want to be sure to have a comfy bed. That doesn’t always mean as soft as possible. For some people, a firmer mattress is necessary to provide the right amount of spine support. Second, you want to use the right pillow. Sleeping on your back requires a softer pillow than sleeping on your side because when you sleep on your side, you need your head to be propped up a little more to leave room for your shoulder. Third, sleep position is key. While pillow choice can make back or side sleeping just fine for your neck, there really isn’t a way to sleep on your stomach without a stiff neck eventually forming. After all, you can’t breathe with your face straight down in the pillow, so you are going to have your head turned to the side for hours at a time. This may not be an option if it is what you do for work but driving (especially on long trips) is really rough on the neck. For one thing, it is pretty much impossible to maintain proper posture in the driver’s seat of most vehicles. Second, you constantly have to turn your head in various directions for safety purposes, sometimes rather quickly. If you are a commuter, you may want to consider public transportation. On long trips, be sure to take plenty of breaks where you can get out of the car and walk around. This is another one that can be really tough, especially if you work in an office. Setting monitors at the proper height (eye-level) can be a key way to deal with neck pain. Also, be aware of how you use mobile devices. Remember how the strain on the neck multiplies when your forward head position reaches 60 degrees? That can happen dozens of times per day if you check your phone with it in your lap rather than holding the phone up. Limiting technology use and using it wisely can help reduce neck pain and the wear and tear that can lead to chronic neck issues down the road. This is a really important way to get long-term neck pain relief. The fact is that if an upper cervical misalignment has occurred, the other things on our list will only provide partial relief. Correcting the underlying misalignment is a necessary part of getting rid of neck pain for good. Before you start envisioning having your neck twisted and yanked around, please note that upper cervical chiropractic uses low force corrections that are safe and gentle. The secret is in the precise measurements that are taken to provide each patient with a custom-fit adjustment, tailored specifically to your needs. If you are suffering from neck pain, you may have just discovered the natural and effective solution that you have been searching for. To learn more, contact a practitioner in your area and schedule a no-obligation consultation today!